Built from 1410 to 1434 as a Chapel-of-Ease. Comprising, nave, north and south aisles, west tower; an outer south aisle was added circa 1500. 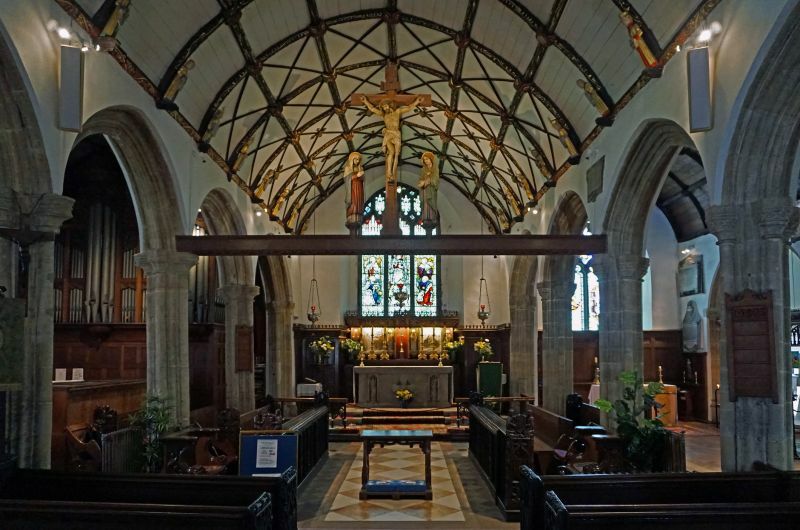 The nave is seven bays and the aisles are the same length. Arcades of four-centred-arches, the capitals to the south arcades are carved with grapes and vine-leaves. Wagon roofs with original carved timber. The tower has four stages, buttresses set away from corners and pinnacles projected on corbels. Several C15 carved bench ends, in chancel ate two completed benches. Pulpit made up of bench ends. C15 monument, brass. Font of possibly C14, granite, circular bowl with carved angels at corners.